The weather is getting chillier these days, the mornings foggier, and I’m layering again, Bay Area-style. In other words, the temperature has dropped below 75 degrees and I’m freezing. I’m also craving heartier food, like meatballs and leafy greens. I can turn on the oven in this weather too, which is perfect, because quite frankly, I’ve always kind of sucked at stovetop meatballs. But oven-baked? I’m a pro. These oven-baked beef meatballs are among my favorites to prepare. No red sauce here: just the meatballs, sauteed kale and radishes, and a couple of secret ingredients: garam masala and miso. That’s right. You’d never guess it, but a dollop of salty-sweet white miso and a sprinkling of warm spices gives these meatballs an extra depth. Cold weather isn’t so bad after all. 1. Preheat oven to 400F degrees. Whisk egg, grated garlic, miso, milk, garam masala, and 1 teaspoon salt in a large bowl. Mix in Pecorino and panko. Add beef gently mix with your hands just until all ingredients are evenly incorporated (do not over-mix). 2. Working one at a time, scoop out 2 heaping tablespoons mealtball mixture and roll into balls between your palms. Place on a foil-lined rimmed baking sheet, spacing 2 inches apart. Bake meatballs until lightly browned on top and cooked through, about 25 minutes. 3. Meanwhile, heat 2 teaspoons oil in a large skillet over medium-high. Add radishes and cook, tossing occasionally, until golden and crisp-tender, about 5 minutes. Add kale and stir, until they wilt, about 5 minutes. 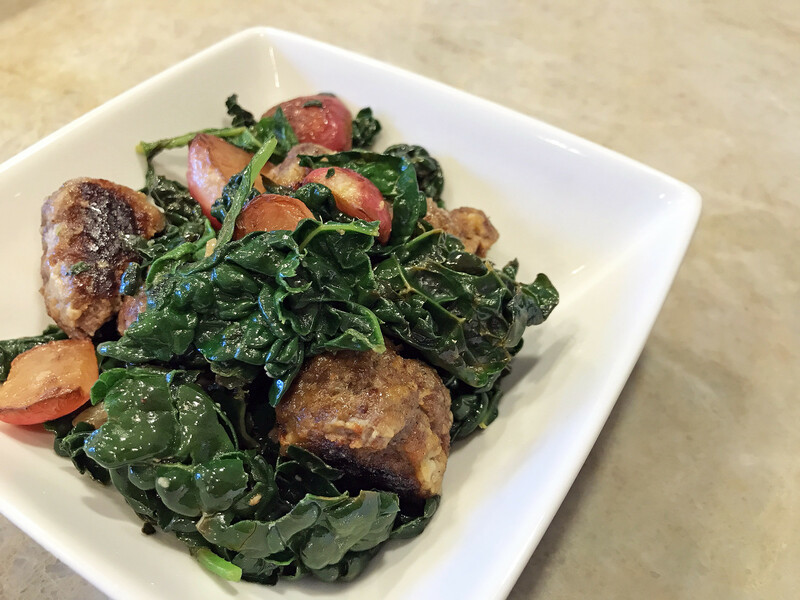 Push kale and radishes to one side of skillet. Pour remaining 1 teaspoon oil on the empty side and add sliced garlic. As soon as garlic starts to sizzle, stir it into vegetables. Remove pan from heat and add lemon juice to mixture; season with salt. Toss well. 3. Tear meatballs in half and add to skillet. Toss everything together and serve warm. This Iranian-inspired main is the perfect dish for when you want something like kabab koobideh but don’t have the patience to fire up the grill. 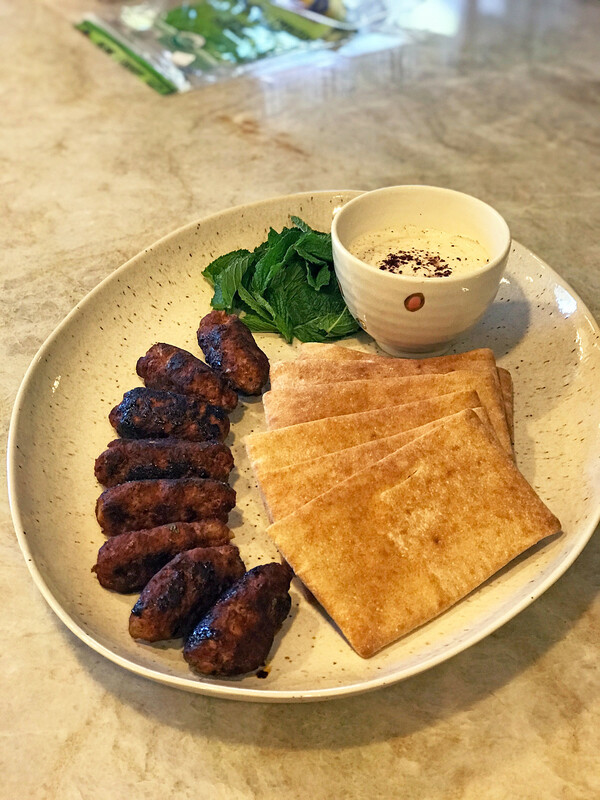 Lightly spiced and easy to put together, this lamb kofta kabab comes together in under an hour. It reminds me of kabab maytabaiyee, a skillet kabab dish that mimics the grilled version but without that charcoal kiss. Use a light hand with the pomegranate molasses: too much and the koftas won’t hold their shape when heated. And a word about kofta versus kabab: in Persian, kabab refers to grilled meat dishes and kofta refers to meatballs. So this is sort of both. This dish isn’t traditional, but rather an amalgamation of distinctly Iranian spices and ingredients. 1. Combine lamb, mint, pomegranate molasses, paprika, onion, garlic, salt, and pepper in a large bowl; mix well. Using clean hands, shape lamb mixture into 1 1/2-inch-thick oval patties. Refrigerate until chilled, about 30 minutes. 2. Heat a nonstick skillet over medium-high and add olive oil. Add patties to the pan and cook until golden brown and cooked through, about 5-8 minutes, turning every few minutes for even cooking. Transfer to a platter and serve with yogurt alongside rice or flatbread. This is the perfect main dish for when it’s a weeknight and you want to pull together something delicious from what’s already in the fridge. Ground beef? Check. Celery? Check. Add a handful of seasonings and a bowl of rice and you’re set. Easy peasy. 1. Cut the celery sticks lengthwise into 1/2-inch strips. Finely chop the strips. 2. Heat the oil in a wok over high heat. Add the ground meat and stir-fry until it is cooked. Then add the chili bean paste and continue to stir-fry until it is fragrant, about 1 minute. Add the ginger and stir-fry for 30 seconds, then add the celery. 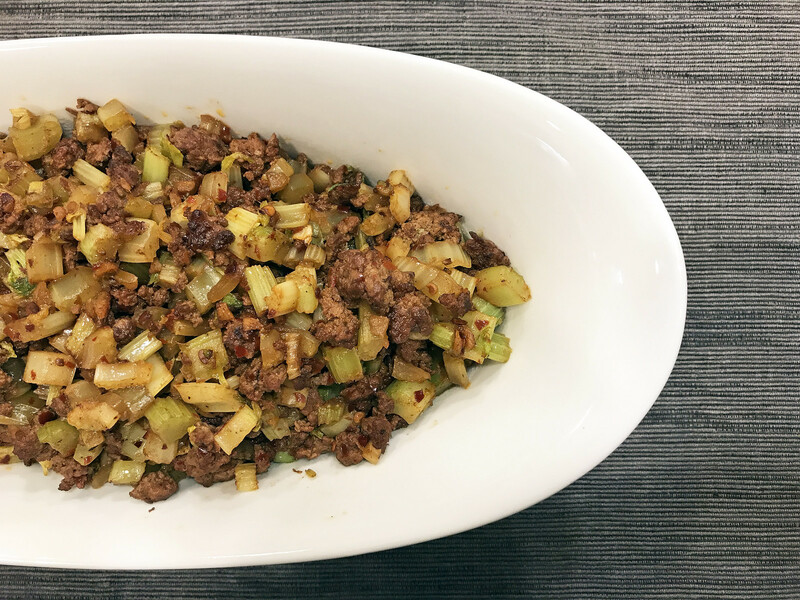 Continue to stir-fry until the celery is tender-crisp, about 3 minutes, adding a little soy sauce to taste. Just before removing from the heat, stir in the vinegar and serve warm. The weather may be warming up (at least in California) but grilling season is still a couple of months away. 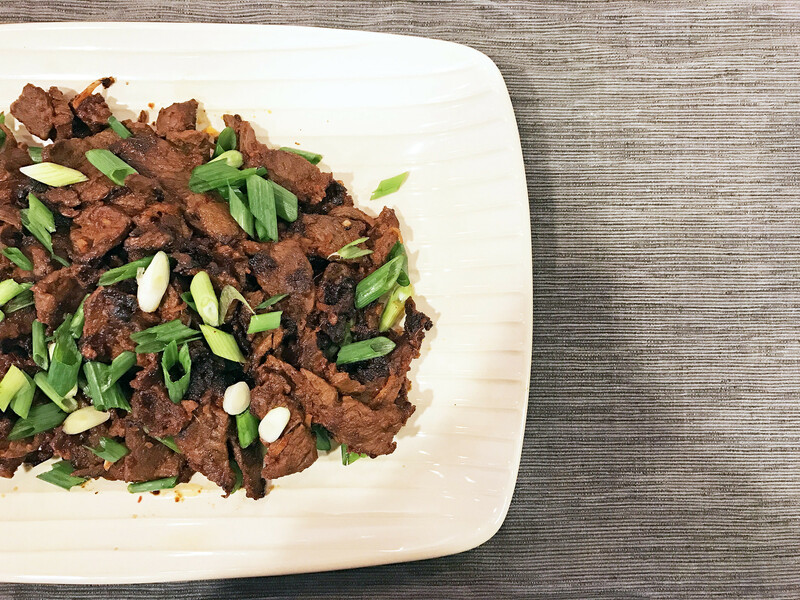 In the meantime, I’ve been satiating my cravings with this spicy beef bulgogi: it’s easy to make on the stovetop but the flavor still imparts a pleasant smoke and char. This marinade is endlessly adaptable and the final dish is fun to enjoy as a group. I served this alongside lettuce leaves, sticky rice, and homemade ssamjang, or Korean barbecue sauce. I include the recipe for my version below. 1. Marinade the beef: combine pear, garlic, soy sauce, gochugaru, ginger, sugar, and sesame oil in a large resealable plastic bag or bowl. Slice meat into very thin strips. Add to marinade, seal bag, and squish everything around until the meat is coated. Let sit at room temperature 30 minutes or chill up to 8 hours. 2. Make the ssamjang: In a bowl, add all the ingredients; stir until combined. Set aside. 3. Heat 1 tablespoon olive oil in a large skillet over medium-high until oil is shimmering. Remove half of meat from marinade, letting excess drip back into bag; cook in a single layer without moving until lightly browned, about 2 minutes. Toss meat and continue to cook, tossing occasionally, until cooked through and crisp at edges, about 4 minutes. Transfer to a plate. Repeat with remaining 1 tablespoon olive oil and remaining meat. Serve topped with green onions. Anything I get to wrap in lettuce to eat makes me happy. (See: bulgogi, spring rolls, etc.) Larb is right up there with the best of them. It’s typically meat seasoned with that perfect balance of hot-sour-salty-sweet and served with sticky rice, herbs, and lettuce to wrap it all up in. Larb is popular in Laos and the Issan region of Thailand and while lamb doesn’t usually factor into traditional larb, I love this unorthodox version. Ground peanuts substitute for the more traditional toasted rice here. Think of this as a protein-packed flavor bomb wrapped up in guilt-free packaging. PS: Please ignore the godawful lighting in this photo. Blame my impatient tummy. 1. Remove tough outer layers from lemongrass. Thinly slice the bottom 6 inches from the bulb end. Pulse lemongrass and garlic in a food processor until finely chopped. Add shallot and Thai chiles and pulse until finely chopped. Transfer to a large bowl; set aside. Pulse peanuts in food processor until coarsely ground and transfer to another bowl; set aside. 2. Whisk lime juice, fish sauce, and sugar in a small bowl; set lime dressing aside. 3. Heat oil in a large skillet over high. Add lamb to skillet and press into a single flat layer with a spatula. Cook, undisturbed, until underside is browned and crisp around the edges, 5–7 minutes. Use spatula to break into smaller pieces and turn. Cook pieces on the other side until edges are crisp and meat is cooked through, about 5 minutes. Transfer lamb to a bowl with a slotted spoon, then use spoon to break up meat into bite-sized pieces. 4. Pour off all but 2 tablespoons oil from skillet and set skillet over medium heat. Cook lemongrass mixture, stirring often, until fragrant and starting to stick to skillet, about 3 minutes. Add reserved lime dressing and peanuts and return reserved lamb to skillet. Toss until meat is coated. Remove from heat and season with more fish sauce, if desired. 5. 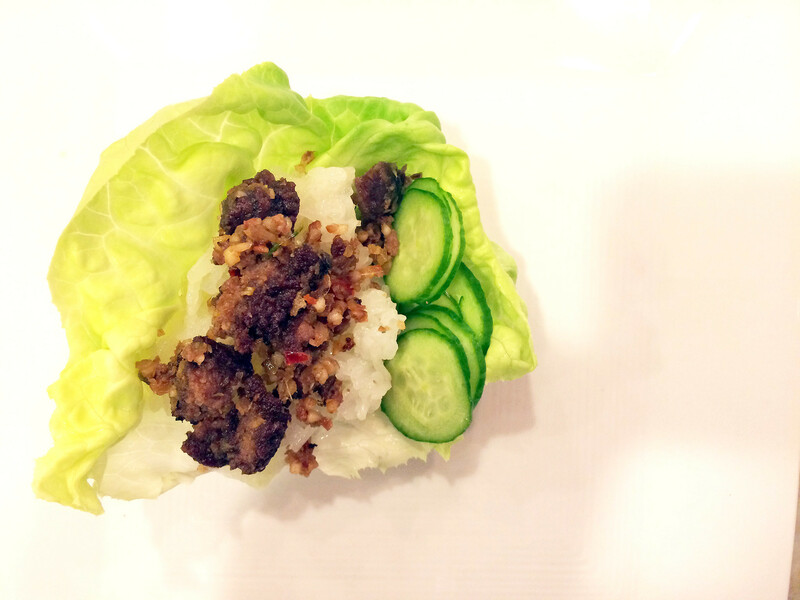 Serve larb with rice, lettuce, cucumber, limes, and mint sprigs for making lettuce cups.